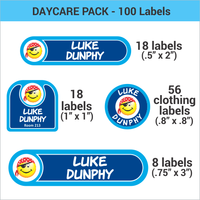 Our stick on, Daycare Label Pack makes labeling easy! The easiest way to label everything that's heading to daycare. These name labels for daycare are perfect for clothing, food containers, sippy cups, diaper bags, backpacks and so much more. 44 - Waterproof, dishwasher-safe labels, (NOT for clothing). Saves you 12% vs. buying the same labels separately! 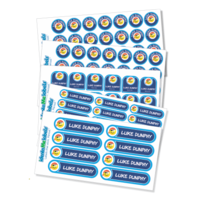 18 Small Square Labels 1.0" x 1.0"
8 Big Circles 1.5" x 1.5"
Our Daycare Label Pack is jam-packed with a variety of sizes of name labels for daycare that will ensure that everything that leaves your home, returns at the end of the day. 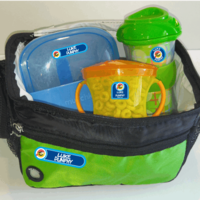 Our label pack includes several sizes and shapes to fit any daycare item including sippy cups, clothes, food containers, jackets, toys, blankets, backpacks, diaper bags, baby bottles and more! Use our labels for kids clothes and other hard surface items in confidence knowing that they're made with child-safe materials. 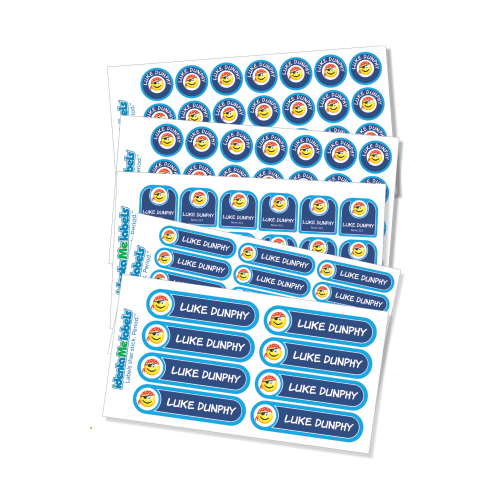 Our stick on name labels for daycare are backed with an industrial strength adhesive that will keep them stuck, use after use and wash after wash! The 56 clothing labels are laminated so they'll stay looking great. The other 44 water-proof labels are also laminated so they're safe to use on just about anything, (NOT clothing). 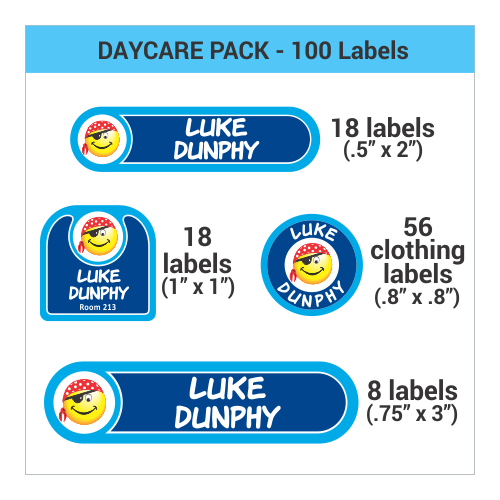 Have fun creating kids' labels for daycare items with our label designer. 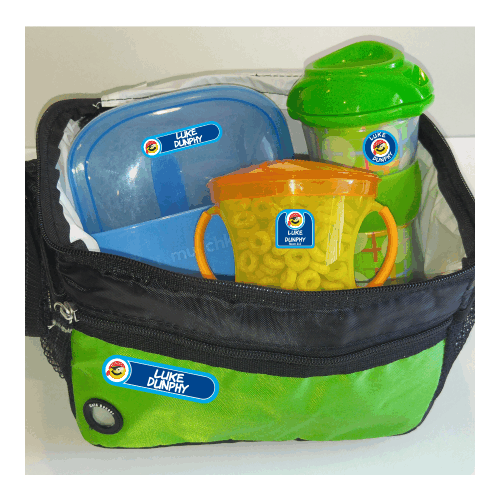 Stop wasting money replacing lost items and personalize a Daycare Label Pack today! You can also buy clothing labels from IdentaMe Labels! Product Safety Information Daycare Labels SHOULD BE APPLIED BY AN ADULT or WITH ADULT SUPERVISION. All of our labels are made with non-toxic materials and eco-solvent inks. Our labels are super sticky and durable but they're not truly permanent. They're made to come off with intent. Continued picking or chewing can make a label come loose from clothing and other materials. Keep an eye on the labeled items if they're going to be used by young children to make sure that they stay intact and are not accidently ingested. 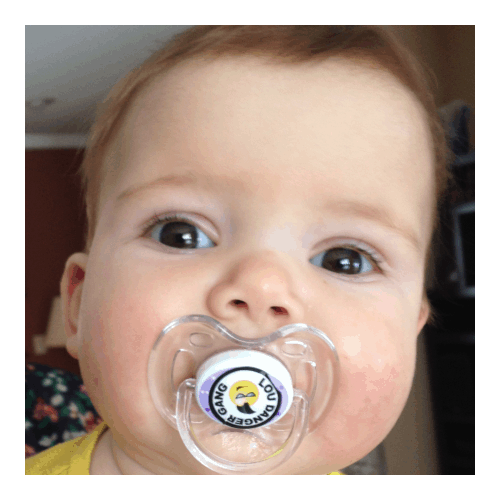 be especially careful when labels are used on teething rings, pacifiers, blankets etc. Our Daycare Label Pack has both, laundry and dishwasher safe labels. Your Daycare Labels Pack will ship using USPS First Class mail unless you choose one of our faster options when you checkout. The faster options are USPS Priority USPS Express, and FedEx Three Day. We can also ship your labels using UPS or other FedEx options - just give us a call and we can work out the details and the cost with you. If you'd like to provide us with your UPS / FedEx account number, we'll have your account billed directly. "I really like your product. I got them yesterday. Much better than what I used to do for my son at daycare. I have labeled sippy cups etc. I took a pic and texted all my friends with your website info."